The diesel pickup aftermarket industry has grown so much in the past 15 years. We can remember a day when it was nearly impossible to buy any aftermarket parts for your diesel pickup to improve the horsepower. Many upgrades came in the form of adapted parts from industrial or big truck engines. Back then, if you wanted more horsepower, you had to build it from scratch. Things have certainly changed over the years. There are so many parts out now from so many different companies that it might seem impossible to figure out what is right for you. Furthermore, it might be even harder to pick a reputable place to buy these parts or have them installed at. So we wanted to take a minute to explain what makes us different. We started in the diesel pickup aftermarket industry in the mid 90's. The owner, John Anderson, was involved in aftermarket performance on diesel pickups from the very beginning. In the late 90's he built what is to believed to be the first twin turbo 7.3 Powerstroke in the country. That white 97 F350 was known all over the country and was making better than 600 horsepower at the wheels in late 2001. That was incredible for the time when most trucks struggled to break the 400-450 horsepower mark with the parts and tuning available. The truck continued to evolve and was a strong contender in the truck pulls circuit. Around the same time John had also developed a twin stage propane system that he was selling to happy diesel owners all over the country. Through several years of development, the twin stage system provided impressive horsepower and mileage gains. It was an answer to the lack of options in fueling that the early diesel trucks were plagued with. John took a break from the diesel performance industry for a few years to help his family's construction business. Even though he had quit selling diesel performance parts to the country, he didn't stop tinkering with diesel pickups. The construction company had a decent size fleet of pickups that were tortured daily. You quickly learn what holds up and what doesn't in this enviroment. Getting to spend day in and day out working a diesel pickup engine hard in a construction setting will teach you things you couldn't possibly learn anywhere else. So fast forward to 2007, John is still doing diesel work on the side and has so much business he decided to devote all his time to the industry and starts Little Power Shop. Through many long lasting contacts in the diesel industry and the good word of mouth the shop has, it quickly grows to be one the premier diesel performance businesses in the country. Why? That's the whole point of this article. If you combine the knowledge and understanding of how to make more horsepower than anyone else with the practical application of diesel power in harsh demanding conditions, you quickly understand how to deliver the exact package of performance parts to meet nearly any customer's needs. But not only that, you can help advise a customer on where they might run into problems with the combination of parts they think they want. Anyone can pick a group of parts and install them on a truck, but what good are they if they wreck your transmission or head gaskets and you can't afford to fix it? What if the truck runs too hot and you can't tow trailers anymore without spending even more money to cool it back down? Quickly I think you can understand that it takes a ton of experience to fit the proper modifications to the customer's unique application. Not to knock most diesel performance shops out there, but most just aren't that well rounded. Any fool can order a ton of parts and spike a big number on a dyno. But will that truck hold together for longer than a good dyno run or two? 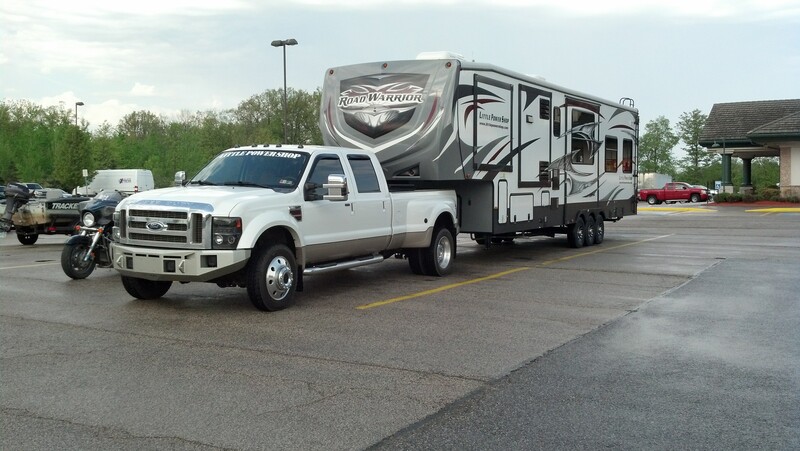 Can you hook to your big rv/boat/race car/contruction trailer and set off across the country without worry? That's a completely different question and you need a uniquely trained group of individuals to answer it. And that's what makes Little Power Shop different from most of the industry. While the company has grown to many employees, all that knowledge that John learned over the years is passed on to the hard working folks at Little Power Shop. Not only that, most of them are deeply involved in their own projects pushing for more power and reliability. The company culture is to keep pushing things to the next level and making them safe for everyday use. 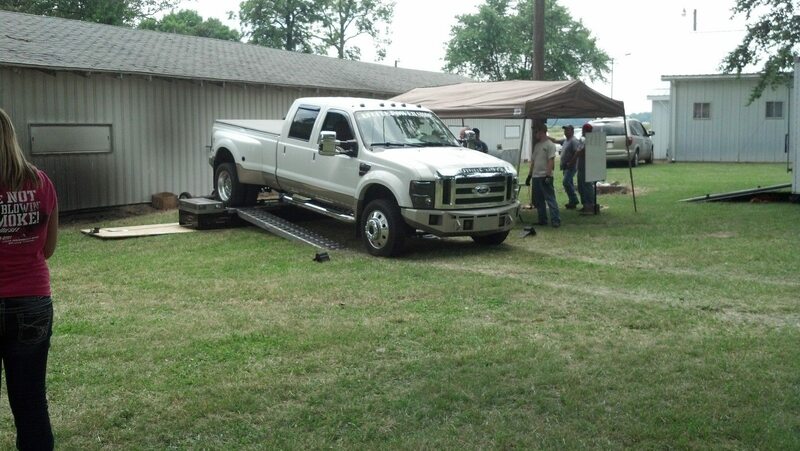 For example, look at our F450 that we use to pull our show trailer. We could have been like everyone else and went out and bought a brand new dually with a nice 100,000 mile warranty on it to tow our big show trailer all across the country. But what would you learn? Instead we picked up this F450 with 100,000 miles on it. It's right at the point that many of our customers are purchasing their trucks. We then start modifying it to meet our needs. Our trailer isn't light either. The truck and trailer weigh in at a little over 30,000 pounds. This truck gets worked just like the last three or four before it that we traveled with. We find all the quirks and weak points by putting 25K plus miles on it a year going to shows. And we aren't messing around with it either. The picture above was taken at a diesel event in the midwest last year. We were set up by the dyno all day and were constantly hearing from everyone who ran that the dyno was reading low. Towards the end of the day we decided to unhook the F450 and toss it on the rollers to see for ourselves. Now we know very well what this truck dynos because we have our own dyno in house. So when it clicked off about 600 horsepower at the wheels we weren't suprised. We then hooked it back up to the big tri-axle trailer and towed it the twelve hours home. We also were third highest for horsepower that day amongst all these "built" diesel trucks that never get connected to a trailer or worked hard a day in their life. So what's the point? That day at the diesel event sort of proves our whole point. Owner after owner was telling us that day that the dyno was wrong because either they figured they had x amount of power or the "shop" that built their truck told them they should have x amount of power. One after another they were disappointed then completely embarrased when our lowly tow vehicle spanked dozens of trucks. As we said before, anyone can bolt a bunch of magazine ad parts on to their truck. It takes years of experience to make them work together properly. And last. So the next time you are deciding where to take your truck or who to buy parts from, stop and ask yourself: Do these people understand what I am doing with my truck? Will they select parts for met that won't damage my engine in the long run costing me more money? We are willing to bet that you find yourself worrying about those answers a lot. That's why we're here. If you ever have a question about your application whether it's performance or repair related, please feel free to contact us. Our business was built on helping people get the most from their trucks and money. We are happy to help anytime.